Because 30% of people with hyperparathyroidism will have more than one parathyroid tumor, the most successful parathyroid surgery only happens when surgeons examine all four parathyroid glands. 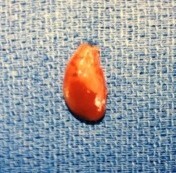 This week we performed 52 parathyroid operations. Seven of these 52 had a previous parathyroid surgery somewhere else that was not successful so they came to see us. 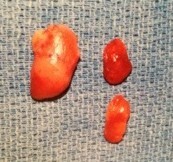 In three cases, the surgeon could not find the parathyroid tumor (and took out one or two normal parathyroid glands). But this blog and this discussion is about the four people THIS WEEK who had a "mini" parathyroid surgery by another surgeon within the past 6 months that was not successful even though a parathyroid tumor was removed. These people had more than one parathyroid tumor and the surgeon took out only one. In these four cases, the surgeon was successful in taking out a parathyroid tumor (adenoma) that showed on their scans, but they were not cured! In each case this was the adenoma that was seen on the patient's sestamibi and/or ultrasound scan PRIOR to the operation, but obviously, these people were not cured because they had more than one parathyroid tumor and the surgeon only took out the one that showed on their scan. So the surgeon did exactly what he/she told the patient they would do: 1) they had a positive scan, 2) the surgeon operated through a small incision (all four incisions were larger that we would make), 3) they removed the parathyroid adenoma that they saw on the scan, 4) they measured the patient's parathyroid hormone (PTH) in the operating room and documented that the PTH "fell by at least 50%", and 5) they closed the wound and ended the operation, and 6) they told the patient they were cured. 70% of people with hyperparathyroidism have one parathyroid adenoma. But we don't know which patients are which! This sestamibi scan was negative. But this is not good enough! This is cheating. This does not make somebody a parathyroid surgery expert. I can get a bunch of medical students to make a hole in somebody's neck and remove a parathyroid tumor that they see on an ultrasound or sestamibi scan. There is no expertise in this! This does not make somebody a parathyroid surgery expert! So when a surgeon claims to be an expert and their only goal is to take out a parathyroid adenoma that they see on a scan they are simply being a technician that is taking the easy route and picking the low hanging fruit. What about the 25-30% of people that won't be cured because they have more than one parathyroid tumor? Will these "experts" tell the patients ahead of time that they have a 25% chance of needing another parathyroid surgery sometime in the future? If you decide to go this route (and many of you do), then please go forward being smart and make sure you get all your blood work after the operation. Don't be fooled by "low" calcium and PTH numbers on the day of your parathyroid surgery-you want to know what your lab numbers are at one or two months after your operation. They better be normal! The CalciumPro App will tell you if you are cured. Sestamibi scans, Ultrasound, and CT scans are not accurate enough to say who has one parathyroid tumor and who has two or more. Parathyroid surgery relying on these scans is a bad trend. Parathyroid scans (sestamibi, ultrasound, and CT scans) are not good enough to tell who has one parathyroid tumor and who has more than one. If your surgeon (or endocrinologist for that matter) thinks you have ONE bad parathyroid gland because only one showed on a scan, than you instantly know they are not experts. Scans are not accurate enough to say this. Scans only find about 60% of the big parathyroid tumors, so if you have a BIG parathyroid tumor, you only have a 60% chance of the scan showing it. The scan will find only about 20% of the small tumors. As one of the inventors/developers of many of the techniques used for sestamibi scans, I can tell you that these scans are not reliable enough to be used to make ANY decisions about your health… whether you should have parathyroid surgery or not, what operation to have, or how many parathyroid glands are bad. Scans can't tell this information! Scans are over emphasized and CANNOT be used to make any decisions! Two parathyroid adenomas are present in about 20% of people with primary hyperparathyroidism. This patient's sestamibi scan was positive for the bigger lower tumor, but missed the smaller one. In two cases of some other surgeon's failed parathyroid surgery we had to fix this week, the calcium level went below 10.0 mg/dl for about 2 months, then it increased to 10.2 to 11.2. In the other two cases, the blood calcium never went below 10.5 (the calcium MUST go below 10.0 and then STAY THERE for the patient to be cured-adults are not allowed to have calcium levels in the 10's). In 3 cases, the PTH was above 70 pg/ml within 2 months, with the 4th maintaining PTH levels in the mid 50's (which is not normal if the calcium is over 10.1). In all four cases the surgeon told the patient that he/she was cured and told them that "sometimes it can take a few months for the levels to come down". This is nonsense-complete nonsense. If the calcium levels are not below 10.0 within one day and STAY there forever, then the patient is not cured (except in very rare conditions). In three of the four cases, the endocrinologist knew the surgeon was confused and knew the patient was not cured of the hyperparathyroidism (the fourth endocrinologist is confused). Note, if you think you are not cured after your operation, then get the Calcium-Pro app for your mobile device. The app will tell you if your parathyroid surgery was successful and if you are cured or not. Measuring parathyroid hormone (PTH) in the operating room looking for a drop of 50% in the PTH level does not work! In all four of these cases of failed parathyroid surgery that we operated on this week, the surgeon quit the operation too early. He/she relied on falling PTH levels in the operating room to predict that there are no other parathyroid tumors. THIS DOES NOT WORK. IF IT DID, WE WOULD DO IT! If it worked, then 10% of the parathyroid operations we do every week would not be taking second parathyroid adenomas out of people who had their first operation done this way. Understand this: A drop of 50% in the PTH in the operating room tells the surgeon that they took out a parathyroid adenoma. That's it! It does NOT tell the surgeon if a second parathyroid tumor exists! The only way to know that a second tumor does not exist is to look at them all. A drop in the PTH of 50% tells that a parathyroid tumor has been removed (95% accurate), it does NOT tell that the patient is cured because it does not comment on the status of the other three glands. Three parathyroid adenomas are seen in about 2% of people with hyperparathyroidism. The sestamibi on this patient showed the large upper tumor but missed the other two adenomas. The fourth parathyroid gland was small and perfect. Watch the parathyroid surgery I performed last year. This surgery took me just under 13 minutes from the time I made the cut until the Band-Aid was in place. The sestamibi scan and ultrasound BOTH said this patient had ONE large parathyroid tumor, but when looking at all of them, we found he had TWO. Note that we don't just "look" at them, we determine the amount of PTH hormone EACH gland is making. Scans only show 60% of big tumors, small ones rarely show. And, when people have two big tumors, almost always the sestamibi scan shows only the one that is making the most hormone-it is dominant and keeping the other one from showing-until the dominant gland is removed. Scans almost never show two tumors when they are present-they only show one (or zero). Just so you know, this operation was filmed by a medical student who was doing parathyroid research for us over the summer. The reason why we keep looking at the clock and the reason why this parathyroid surgery was not edited (done in one shot) is because we want to show you that experts CAN perform a 4-gland operation through a very small incision, very quickly, safely, and without putting a tube in the patient's windpipe. The four pictures you see on this page were all taken on ONE day in June, 2013. On that day we performed 11 parathyroid operations (as usual). We had 7 people with one parathyroid tumor, two people had two parathyroid adenomas, one person had 3 adenomas (the rarest of all), and one person had 4 bad glands (called hyperplasia-also quite uncommon). Look at the pictures and note that most of the scans were either negative, or when positive only showed the largest of the tumors and never showed the second tumor. This is why you want your surgeon to look at all four glands! Folks, listen carefully. We understand very well that everybody can't come to Tampa for their parathyroid surgery. We also know there are some really good parathyroid surgeons out there. However, there are guys in every town now who call themselves "parathyroid experts" claiming to perform mini-parathyroid surgery on people with a positive scan (they can't do mini parathyroid surgery on people with a negative scan because they are not experts!). If you have surgery by one of these guys and they take out the parathyroid tumor that shows on your scan and then "measure the parathyroid hormone to see how much it falls", know that 1) you have a 15% chance of having a huge operation and not a mini-operation because scans are not always right even when positive, and 2) you have about a 20% chance of needing another parathyroid operation in the future. 10% of these patients will need another operation within the next 6 months (like the four cases that are the subject of this blog). If these surgeons tell you that they measure the PTH in the operating room and that will give a cure rate of 99% or better without looking at all four parathyroid glands, then they are not being honest with you. That simply is not possible. Be smart and remember, there is no "doctor police". Doctors can say and do anything they want… and they do. Parathyroid hyperplasia of all four parathyroid glands is seen in about 3% of primary hyperparathyroidism. No big deal, you just leave part of the BEST one inside the neck. The sestamibi scan on this patient was completely negative, showing none of these overactive glands. We do about 2600 parathyroid operations per year. We have the best technology, and enough money to buy any new technology that we need or want. If measuring PTH in the operating room worked and had value, then we would do it. We do not. 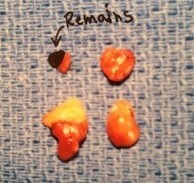 If removing the one parathyroid tumor that shows on a scan was all that was necessary, then that is what we would do. We do not. We cannot have people traveling hundreds or thousands of miles and not be cured. The ONLY way to assure very high cure rates (over 90% theoretically, and 99% in our case) is to see all four parathyroid glands in all patients. This is what we do. If your surgeon says you can have a cure rate over 90% and he/she is going to look at only the one tumor that shows on your scan, then he/she is either not being honest with you, or they simply don't follow their patients for more than a month and they simply don't know their patients are going to some other surgeon for their second operation. Finally, understand that we PREFER negative scans! The negative information on a scan is much more reliable than the positive information. ALL other doctors (and all patients!) want to see a positive scan. WE DO NOT. We do the exact same parathyroid operation on ALL people and having a positive scan does not save us even 10 seconds in the operating room (watch the video). We need to see all the tiny small parathyroid glands (the size of a grain of rice), so showing us where the really big one is doesn't help us a bit. STOP PUTTING SO MUCH EMPHASIS ON SCANS! If your doctor emphasizes the results of a scan, then you will know they are not experts in parathyroid disease or parathyroid surgery. Scans do not show at least 50% of parathyroid tumors, are not accurate enough to allow any conclusions about the other glands, and when "positive" for a parathyroid tumor are wrong about 50% of the time. Scans are emphasized by insecure surgeons and inexperienced endocrinologists. Be smart out there! Be an informed consumer and take care of each other. Demand the best from your doctors… they work for YOU! 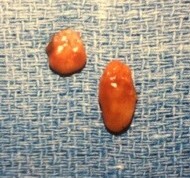 Video of Dr Norman performing 4-gland parathyroid surgery in 13 minutes, narrated by Dr Politz. Dr Norman's invited editorial in the Journal of Surgical Oncology in 2012 telling other surgeons to get their act together and stop putting so much emphasis on scans. Drs Norman, Politz, and Lopez landmark publication in the Journal of the American College of Surgeons in 2012 describing the high recurrence rate in 16,000 patients followed for 18 years who did not have all four parathyroid glands examined.